In anticipation of the big day, I thought I’d share some of my Halloween Day viewing quirks. “Boo, Don’t Turn off the Lights” reveals what films I can watch only while it’s still light outside. 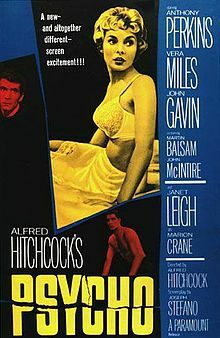 Directed by the “Master of Suspense”, Sir Alfred Hitchcock, it turned the audience perception of a movie plot on its head. There were lines wrapped around the block and absolutely NO ADMISSION after the movie began. Sir Alfred, such a tease. For more on Al, please click here. A previous post tribute. Starring Anthony Perkins and Janet Leigh, the screenplay is by Joseph Stefano and based on the 1959 novel of the same name by Robert Bloch. To fully appreciate the creepy effect of the film understand that the character of Norman Bates is loosely inspired by the crimes of Wisconsin murderer and grave robber Ed Gein. I can’t give anything away, but the shower scene is legendary and a reason to watch with the lights on! OMG, I add extra lighting when watching this definitive Halloween classic! The unrelenting Michael Myers character is the scariest psycho of all time! Dr. Sam Loomis: (Donald Pleasence) I met him, fifteen years ago; I was told there was nothing left; no reason, no conscience, no understanding; and even the most rudimentary sense of life or death, of good or evil, right or wrong. I met this six-year-old child, with this blank, pale, emotionless face, and the blackest eyes… the devil’s eyes. I spent eight years trying to reach him, and then another seven trying to keep him locked up because I realized that what was living behind that boy’s eyes was purely and simply… evil. The cinematic significance of this film is unlike other slasher movies of the day, the heroine is intelligent and continually devising ways to get away from the killer. Jamie Lee as Laurie is sweet, compassionate and determined to save the kids she’s babysitting and herself from death and live through Halloween night. Shout out to the first horror “Scream Queen! (for you trivia buffs check-out Wes Craven’s Scream (1996) for a movie reference). 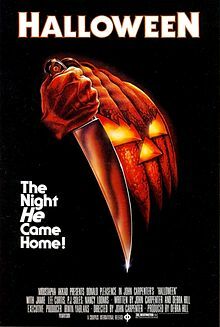 Halloween (1978) was the film’s inspiration. Boo! Don’t Turn Off the Lights! This entry was posted in Actors, Actresses, Classic Films, Directors, Film History, Horror, Writers and tagged Alfred Hitchcock, Anthony Perkins, boogeyman, Halloween, Jamie Lee Curtis, Janet Leigh, John Carpenter, Michael Myers, Norman Bates, Psycho, Robert Bloch, Scream, Wes Craven. Bookmark the permalink.